One of the most common questions among pianists is how to go about learning new pieces more effectively. Therefore, we’re pleased to announce the launch of From the Ground Up, a new series of resources on the Online Academy which directly addresses this question. 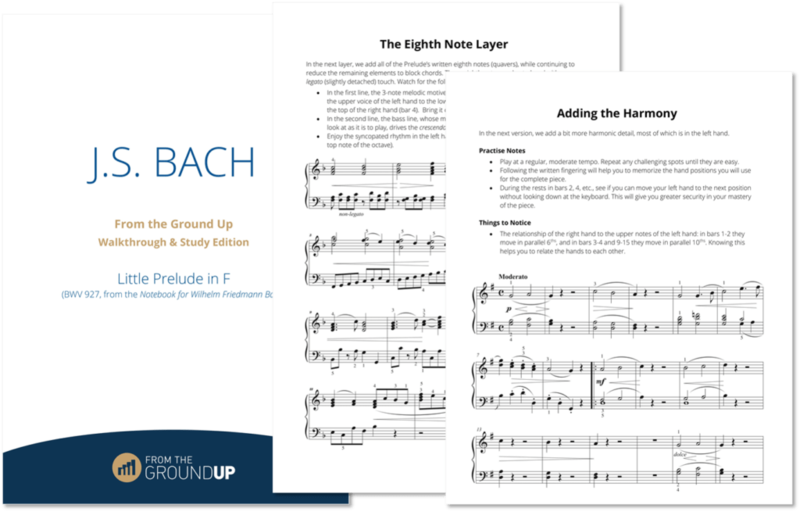 From the Ground Up is a series devoted to learning individual pieces using outlines and reduced scores that help you to practise more effectively, memorize more consciously, and interpret music more creatively. Each From the Ground Up edition starts with a reduced score or foundation which reveals the essential structure of the music. Detail is then added in layers through successive scores thus enabling learning of a piece from the ground up rather than the top down. Practising in this manner helps not only to learn a particular piece with efficiency and understanding, but also to practise more creatively in general. How to access From the Ground Up?